Here is another terrific and gorgeous lemon oven door towel. 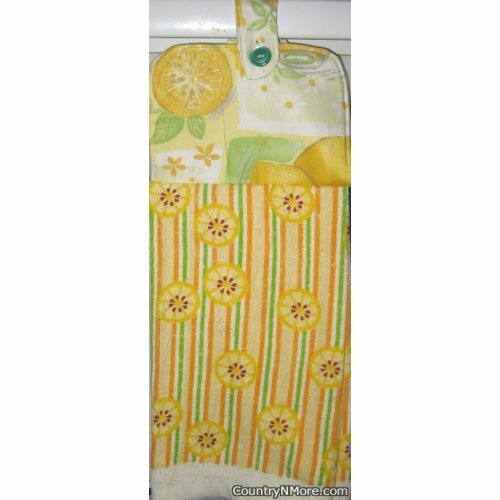 We used a lemon theme towel with small cut lemons, along with orange, yellow, and green stripes. The top part of this oven door towel, features a large cut lemon in the upper left hand corner, and a hint of some lemons on the lower right hand corner. The colors in the fabric print and the towel fit so well together. We have other lemon theme oven door towels using the same towel and fabric. The design placement on the fabric top is so unique from one to the next, that we have chosen to list them separately.